Normally, you will be hearing about the lowering of Weiss Lake for winter pool as fall approaches. But just like last year at this time, another summer season drought had the lake already down for winter pool. Weiss Lake was unseasonably low this past summer season. Just how low? Mid August showed the lake down five feet. This set some summertime low water records, for never has this lake been this low during the summer season. So how has this changed the bass fishing during the fall period? Tremendously. In the past under normal, full pool, early fall conditions these Weiss Lake bass are usually heading for the weedy shallows of this lake. Usually, these bass have related to shallow water aquatic weeds, wood cover and rock cover all summer long. They have buried up in the ever growing weeds all summer long and many bass refuse to leave the security of their oxygen rich aquatic weed homes, even as the lakes waters begin to cool. So like the bass (looking for an easy meal), bass anglers too have to eliminate the aquatic weeds in their search for this ever elusive quarry. This means targeting places they hang around otherwise. For no matter what the conditions these bass have got to eat. The Lakes headwaters begins the slow meandering journey of this first of six lakes situated on the Coosa River System. Weiss Lake was impounded in 1961 backing up the waters of the original Coosa River System. Places like Mcgee bend, Fosters bend and Morton bend are actually located in the lakes headwaters, that stretch far into northwestern Georgia. So are some of the lakes major feeder creeks like Cedar Creek, King Creek and Mount Hope Creek. Many of these creeks (at normal full pool levels) usually feature water depths of less than five feet. Most, (but Cedar creek) have actually been high and dry with the past summer drought. Many Alabama anglers never even venture this far into Weiss Lakes headwaters. There is a lot to fish from Weiss Lakes headwaters on the Alabama / Georgia State lines, without going any further up the lake. Besides, with unseasonably low lake levels this past summer season many anglers just navigated their boats into much safer waters, places with marked river channel buoys and much safer places with deep water found nearby. Mid lake on Weiss Lake during low water is considered safer for navigation. From the Alabama / Georgia State lines to the lakes lower Weiss Lake dam is a lot of water for anglers to fish this fall season. Low water concentrates bass and baitfish, showing the lakes headwaters actually narrowed down to just an old, original river channel. This means fishing the mouths of creeks and small pockets, islands and main lake points located in the lakes headwaters, can all position an angler in some places bass are now crowded into, places other anglers avoid. Mid Lake is considered some of the lakes best fishing during the fall period. This can be fishing the mouths of smaller feeder creeks like Ballplay Creek, Mud Creek and Three Mile creek, creeks mostly dry with flats exposed during lake drawdown. There are deeper creeks with navigable waters. Creeks like Spring creek and Cowan creek are located above the Hwy. 68 causeway crossing and they house schools of bass holding around piers, boat houses, marinas and wood cover like stumps, laying trees and resident planted brushpiles. Rocky points, man made rip-rap rocks lining causeways and bridges are also good locations for finding bass this fall season on Weiss Lake. Besides major feeder creeks there is a lot to explore in the lakes mid section this fall season. Above the Hwy. 68 crossing Yanceys bend, Pruett’s Island and Godfrey’s Island are good shallow water flats near deep water drop-offs that hold bass year round. Evident schools of baitfish and bass busting on top calls for numbers of lure selections when waters begin to cool in early fall. Topwater lures should always be tried on every location during fall’s early mornings, late evenings or often all day if cloudy or raining. Lures like zara spooks, buzzbaits, prop baits and popping type topwaters are good choices. Also try spinnerbaits, crankbaits and lipless lures like rattletraps, for these schooling bass. Jigging spoons under these schooling bass seen on top, can show a good chance for an astute angler to fool some of the lakes bigger, more lazy bass. These over sized largemouth bass are usually feeding and holding down below the smaller schooling bass that are seen feeding on top. They are picking off the injured or dying baitfish that look like jigging spoons fluttering down below. Tailspinners, curly tail grubs or shad imitations fished on jig heads, blade baits or inline spinners are also good lure choices for schooling activity. 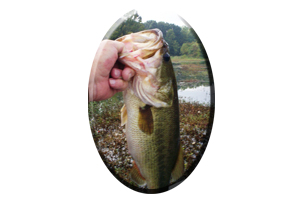 Both hard bodied jerkbaits and soft jerkbaits are excellent lure choices, including suspending hard bodied jerkbaits and shallow to mid running crankbaits in colors of white, chrome or shad patterns. Experiment with your lure choice. Have several rods already rigged and ready to fish, with various types of lures. On every outing to Weiss Lake these bass will hit a certain lure. One certain lure they will hit, one that can display a certain action, shape, color or size they may like better than other lures. 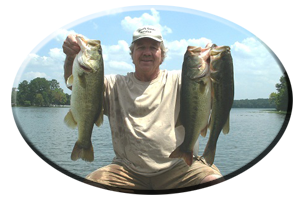 The only way to discover the days preference is to offer these bass many lures choices when they are actively feeding and foolishly attacking these baitfish schools during the fall and early winter period. * A word of caution! Stay within the red and green channel markers when navigating Weiss Lake at low pool. There are many boating accidents every year when this lake is low. Venturing out of the main river channel can show an angler quickly navigating away from the buoys, through some very dangerous waters, often in 1-2 feet of stump filled waters left here during impoundment when stump flats were cleared. Laying logs and other obstructions (like rock piles) are visible or just beneath the waters surface. Use extreme caution this fall and winter season when boating on Weiss Lake. An area starting at the Hwy. 68 causeway crossing, all the way to the Weiss Lake dam is considered lower lake fishing. There are two major rivers that feed the lake here. The Little River and the Chatuga River. 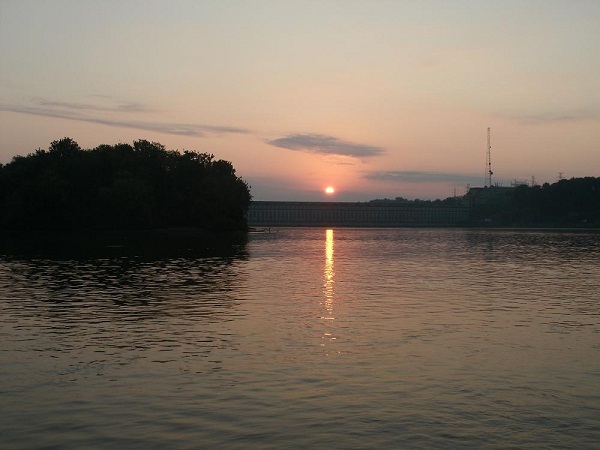 Buffington’s Island and Hog Island are where both of these major incoming suppliers of fresh and cool river waters, join together and form main lake waters with the Coosa River channel. Any time you have three major river systems join together — it is a fish gathering spot year round. There is also plenty of fish holding cover to explore in these two incoming rivers. In addition both rivers feature piers, boat houses, stump flats, small islands and main lake points. During impoundment left here were underwater ponds (and now submerged lakes) that can be found with map study, including old house foundations and roadbeds now submerged. With low water there is now plenty of evident flats loaded with laying logs, fallen trees, stumps, brush piles and other wood cover. This including rock cover bass relate to as well. Like man made rip-rap rocks (for erosion) and natural banks featuring rock piles and boulders, all seen during low water. Hazard buoys are placed lake wide marking shallow stumps, rock piles and other dangerous areas, but still anglers should practice navigating their boat with extreme caution. Use your boats electronics and idle along watching your depth finder when out of the marked red and green buoys on the main river channel or deeper creek channels. From the main lake at Hog Island to about half way up in these two main feeder rivers, is all a first time angler should safely attempt to run the boat during low pool. Besides being able to spend an entire day in the incoming Little River and Chatuga Rivers there is a whole lot more for fall anglers to explore this fall and early winter seasons. Yellow Creek Falls, Big Nose Creek and Little Nose Creek and many unnamed coves, small pockets adorn the lower lake all the way to Weiss Lake dam. Great places to fish this fall that are usually loaded with schools of baitfish and feeding bass. 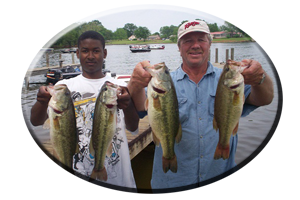 Unknown to many anglers there is also a power house pool located through a small canal leading from Weiss Lake dam downstream to the Weiss Lake dam powerhouse. This is small lake in itself and often it gets loaded with baitfish that are funneled down through the connecting canal. Baitfish that cannot escape the feeding activity of both Coosa River spotted bass, largemouth bass and striped bass that are found here in the fall and early winter seasons. Explore massive, Weiss Lake this fall season, but like said, “with caution,” first timers especially. It is a great time to bring along a camera, hand held GPS and a map, to mark and reference shallow water places that will be flooded again in the spring.